Over the course of history, stringed musical instrument builders have pursued their fine craft and experimented with various kinds of wood in the production of instruments of both visual and auditory beauty. 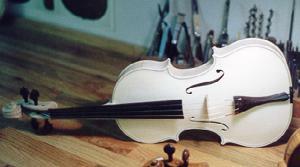 The lutes shown to the right, and the unfinished violin shown farther down the page, were built by modern day master luthier, Lawrence K. Brown. They learned that each and every species and subspecies of wood had a unique cellular structure and density, resulting in different strength characteristics and behavior under stress. Wood favored for use in the general body or outer structure of the instrument was typically a "hard wood" species, and may have spectacular grain patterns and colors. However, the sound board, or the top of the resonating chamber, would be a clear, straight grained "soft wood," chosen for it's unique quality of resonating brightly to the sound of musical notes plucked on strings. Builders of pianos, harpsicords, harps, guitars, mandolins, cellos, violins, violas, lutes, basses, all came to prefer spruce wood as a standard for their sound boards. This elegant classic guitar shown front and back was built by master builder Robert Ruck. The top is Engelmann Spruce. The body and sides are Brasilian Rosewood. A soundboard enables an acoustic instrument to throw out amplified vibrations of musical notes in a way which can only partly be explained in scientific terms, the rest bordering on the mystical. Builders are known to talk how the wood from a certain tree from a specific area gave an instrument an especially exceptional "voice" unlike all others. Engelmann spruce topwood from the glaciated valleys of the Rocky Mountains of British Columbia, Idaho, and Montana, for instance, is reported to be particularly special. 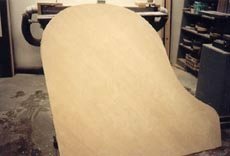 Shown is a large edge-glued panel of spruce wood, the soundboard of a grand piano. Despite the extreme variations in soils and weather experienced by centuries old individual trees, high graded spruce boards will exhibit the consistent color, density, strength, and resonance that Master Builders have insisted on for centuries. Traditionally, instrument grade trees have been harvested and handsplit with great care to obtain the best parts for instrument building.